The Canon EOS Rebel T7, also called the EOS 2000D and KISS X90 in certain locales, is another iteration in Canon's long and mature line of ultra-popular entry-level DSLR cameras. As expected, each Rebel successor is better than the previous model it (eventually) replaces and the upgrade list for the Rebel T7 is short – singular. But fortunately, it is a significant one. The same, excellent 24 MP imaging sensor currently featured in most of Canon's APS-C format DSLR and MILC lineup has landed in the least-expensive entry level Canon EOS DSLR. Thanks to the cost efficiencies experienced by standardizing nearly their entire APS-C lineup on the same imaging sensor, Canon can afford to give the Rebel T7 the same imaging sensor found in even much higher-end EOS models including the 80D, M5 and many others. While those stepping up from a mobile phone camera or a point and shoot will quickly see the value of the Canon EOS Rebel T7 (especially in the dramatically-better image quality), many who follow this site regularly (serious amateur and professional photographers) may be far less than excited by the announcement of an entry level DSLR model. Although this may not be the ideal primary camera for the latter group, some beginning professionals may want at least one of these cameras in their kits (more about this later) and all of us need to recognize the importance of this camera. That importance is summed up by image quality per dollar. For a bargain price, the Rebel T7, like the Rebel T6 and T5 before it, can deliver full-on professional grade image quality with small size and light weight being two more important advantages this camera has. Practically everyone owns a phone with a camera, but even the best phone camera images fall far short in comparison to a DSLR image. Phone images may look nice when viewed on a phone or output to a small sized print (if captured in bright light), but they fall apart when viewed large on a monitor or print. In addition to delivering pro-grade image quality, the Rebel T7 serves as an economically feasible gateway to a photography education, opening the door to serious photography pursuits. Owning even a base DSLR model puts one on the path of truly knowing the various facets of photography, not simply composition. With the use of interchangeable lenses, a DSLR photographer can express themselves in so many different ways – through wide angle, telephoto, fisheye, and tilt-shift lenses and from apertures f/1.2 to f/45. 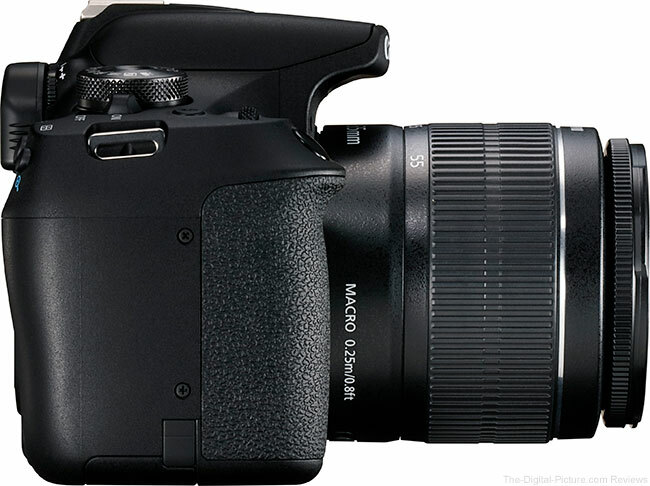 The inexpensive T7 is a key that can unlock the door to all the benefits of DSLR photography. Thus, the T7 is much more than its price tag – it represents a world of imaging that remains inaccessible to smart phone photographers. Because a camera review can take several weeks to complete and because I have reviewed the Rebel T6 along with many EOS cameras using the T7's imaging sensor, this review is going to be a hands-off one. I can tell you what you need to know and will invest that several weeks of time working with other products. The notable upgrades for the T6 were built-in Wi-Fi and NFC connectivity, increased LCD resolution and an increased JPEG buffer. Again, the first item on this list represents the T7's only feature upgrade. Fortunately, it is a significant one. 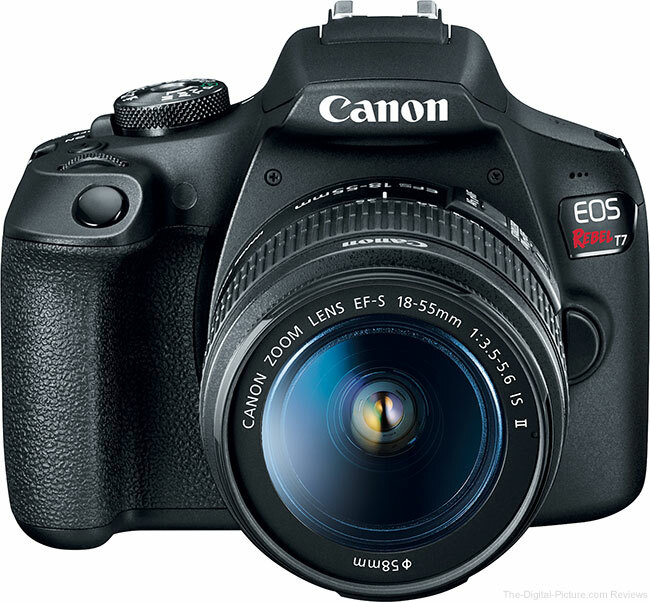 View the full Canon EOS Rebel T6 specifications to compare additional cameras. While the number of megapixels is quickly touted by marketing departments, not all megapixels are created equally. There is no question that camera phones are wildly popular today, but this popularity is primarily due to their convenience, not the image quality being delivered by their tiny imaging sensors, as mentioned earlier. When reviewing the Rebel T6, I had recently upgraded my 4-year-old Apple iPhone 5 to that review-time-latest and greatest iPhone 6s. While I use my phone's camera occasionally, it is usually for something of low importance such as capturing the car's odometer setting for an expense report – and I seldom look at the results at 100% resolution. With the iPhone 6s being promoted by Apple for its "New 12-megapixel iSight camera with 1.22µm pixel size resolution", I thought that I might start using the phone camera more frequently. When I first looked at the results at 100%, I thought there must be a reason why they were not clear, but didn't have time to figure out the reason why at the time. Notice the details missing in the iPhone image. To be kind, I would call this a painterly effect. If captured in the first place, the details appear to have been processed away, perhaps by noise reduction algorithms being applied. The iPhone 6s image was taken at ISO 25 which should produce the best image quality that the smartphone’s camera is capable of. However, the image quality produced by the iPhone 6s at its lowest ISO setting significantly trails the T6’s image quality at its lowest ISO (and beyond). I assure you that the smartphone’s image quality does not improve once higher ISOs are used in low light conditions. ISO 25 is 2 stops darker than ISO 100. Note that this is not a completely "Apple-to-Apples" comparison (sorry, couldn't resist that pun). By framing the 3:2 aspect ratio target properly in the vertical dimension, I gave the 4:3 aspect ratio iPhone the appearance of having a higher resolution in this comparison – but the sides of the target are cropped off. The iPhone was in fully automatic mode, selecting 1/40, f/2.2 and, as labeled, ISO 25. The Rebel T6 was in manual mode with 1/10, f/6.3 and ISO 100 selected. Both cameras were tripod-mounted. Both images utilized auto white balance, with the Canon producing a much better color balance from the daylight-balanced tungsten lights being used. With 14-bit RAW format available (and used), Rebel T6 images offer a much wider latitude in adjustments which can be utilized without destruction to the original images (vs. 8-bit JPG). And, the T7 has significantly higher resolution than the T6. While this image looks nice on my phone and would look nice on Instagram or SnapChat, viewing larger reveals a lot. It is hard to argue with the convenience of a phone camera, but ... the image quality difference between it and a DSLR is dramatic. Don't let your precious memories be captured in low quality. While the Rebel T7 has a higher megapixel count than the current phone cameras, sensor size plays a huge role in image quality and Canon DSLR cameras minimally have an APS-C format imaging sensor. Here is a graphic that helps visualize the sensor size difference across some of the available sensor formats. All other attributes being the same, bigger is better when it comes to sensor size and how that size relates to image quality. Larger sensors can capture more light. The Rebel T7's 3.7µm pixels are better able to determine the proper color and brightness than the iPhone 6s' 1.22µm pixels, and it features substantially more of them. The Rebel T7, like all of the digital Rebel models before it, features an APS-C (1.6x) sized sensor. This means that all of Canon's EF-S, EF, TS-E and MP-E series lenses are compatible, though the outer portion of the image circle projected by full frame compatible lenses (EF, TS-E and MP-E) is not utilized. This also means that a selected lens focal length will frame a scene similar to that of a 1.6x longer focal length mounted on a full frame sensor camera (including when using APS-C-only lenses such as the EF-S series). For example, a 50mm lens mounted to an APS-C camera will provide the same angle of view as an 80mm lens mounted to a full frame camera. As I said before, in part because this camera shares the same sensor as many of the other same-era Canon APS-C camera models, I'm creating this review hands-off. From an image quality perspective, I'll drop in the sibling Rebel T7i's description. While there may be differences in real life, they should be too small to have bearing on a decision. While the Rebel T6 did not get a resolution upgrade from its predecessor and it delivered 18 megapixels sharply, the T7's 24 MP resolution increase is a noticeable one. Here is the Rebel T7i vs. Rebel T6 comparison. Build your own comparisons between other camera models using the just-provided link. Results for many other EOS DSLRs are available in the image quality comparison tool using the referenced Canon EF 200mm f/2L IS USM Lens and some older camera models are represented by the Canon EF 200mm f/2.8L II USM Lens. With APS-C 24.2 MP imaging sensors having a 3.7µm pixel pitch, diffraction begins impacting sharpness with apertures narrower than f/6.0 (DLA). Results at f/8 begin to show very modest softening and at f/11, you are going to see the difference in your images. This does not say that you should not use f/11, but you should be aware of the penalty being paid for using apertures narrower than the DLA and be discerning with your exposure choices. Use the tool to learn how diffraction affects sharpness and you will be prepared to make knowledgeable decisions in the field. Another consideration for the use of cameras with pixel-dense sensors is the shutter speed required to stop camera or subject motion. Because the pixel density in camera sensors has been increasing over the years, blur and a loss of pixel-level sharpness are increasingly likely due to camera and subject motion causing subject details to cross over pixels at a faster rate. That is unless a faster minimum shutter speed is used for handholding (image stabilization also plays an important role) and for photographing fast-moving subjects. The old 1/(focal length * 1.6) rule to determine one's shortest shutter speed for handholding an APS-C camera (without the aid of image stabilization) may not be adequate for everyone. While this formula uses the easy-to-remember 1.6 factor that matches the APS-C sensor angle of view difference, the pixel density of the imaging sensor is the real reason the faster speed has been needed. You may prefer to use the 1/(focal length * 2) as a better base estimate for handholding the T7. Another consideration for getting the most from a high resolution camera is the quality of the lens placed in front of it, as increased resolution will magnify any lens aberrations present. As always, the better the lens, the better the image quality. Increase resolution without any other technological improvements and noise increase is to be expected. Fortunately, gains continue to be made in this regard. 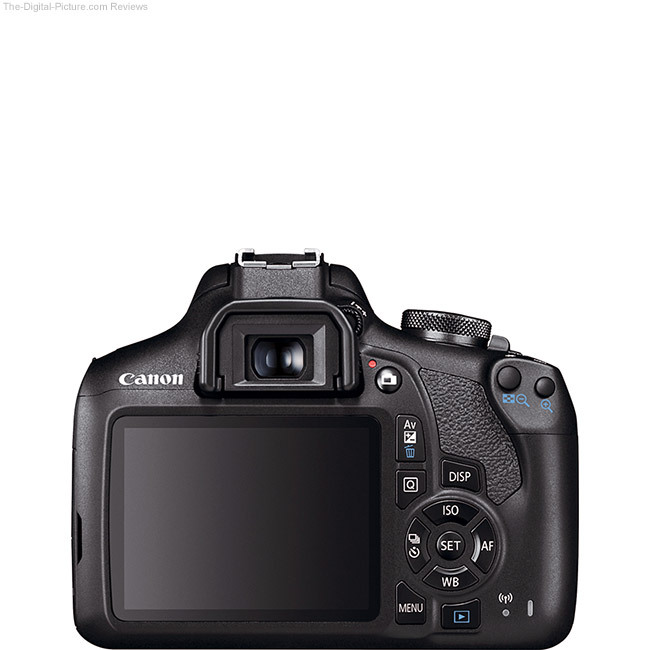 Ctrl-click on the previous link to open the T7i vs. T6 comparison in a new tab. The T7i at least matches the T6's pixel-level noise and even appears to slightly exceed it at very high ISO settings. That performance is despite the increased resolution. The differences seen in the T7i vs. T6 comparison are, by themselves, not likely to generate an urgent need to upgrade from the T6 from a low noise perspective. However, the difference from the T5 makes an upgrade more compelling. Comparisons against full frame models will show the larger sensor advantage. As the ISO setting increases, noise becomes more apparent. This is and always has been the rule. The big question is, how apparent is the difference between camera models? If you can't see the difference, you will not likely discern it in your images either. The T7i's ISO 100 results are very clean – this is the norm for Canon EOS cameras. Noise levels steadily increase as higher ISO settings are used until I get uncomfortable with noise levels at around ISO 6400. ISO 6400-captured images are noisy, but they can be usable. I consider ISO 12800 a last resort and a significant percentage of the details get lost in the low signal-to-noise ratio at ISO 25600. The RAW-captured standard results discussed above utilize Canon's DPP (Digital Photo Professional) Standard Picture Style with a sharpness setting of 1 (very low) and no noise reduction – very real-world settings for me. I use the Neutral Picture Style in-camera with RAW capture because it applies a lower contrast tone curve to images, providing a better picture of the camera's available dynamic range on the histogram shown on the LCD. Neutral Picture Style results appear somewhat dull and while there is a time to use the Neutral Picture Style in production, I usually change my RAW images to the Standard Picture Style immediately after importing them and then adjust sharpness to a lower-than-default level. In addition to the standard T7i test results, you will find a set of images showing the DPP auto-applied noise reduction settings. Noise reduction processing, available in various strengths in-camera or during post processing, makes a big difference in noticeable noise levels. The downside is that noise reduction is destructive to image details, so the optimal balance must be found and I suggest that you start with the off setting if shooting at ISO 100 or 200 and the low setting for the higher ISO settings. Or, better yet, shoot in RAW format and adjust to taste later. Like the rest of the current Rebel models, the entry-level Rebel T7 is not targeted for professional use. However, the image quality the camera delivers will far surpasses the minimum quality needed for many professional uses. Digital files of course require memory for storage. The following table shows comparative RAW file sizes for a photo of a standard in-studio setup with a moderately-high amount of detail taken with the referenced Canon EOS DSLR body. The Rebel T7 writes image files to an SD/SDHC/SDXC memory card (compatible with Eye-Fi cards, not compatible with the UHS speed class). Canon EOS cameras always offer a variety of size and quality .JPG file format options with these having a far smaller footprint than RAW files, but ... I strongly recommend using the RAW format. It is not hard to learn to post process RAW images to perfection – a RAW processing workflow is easy to create. Canon's Digital Photo Professional software is free and generates high quality results. For an ISO 100 image, you can roughly figure 1.3MB in RAW file size per megapixel of resolution. That memory card prices continue to dive makes this issue minor in financial terms. Buy plenty of high-capacity memory cards and rotate cards to maintain a backup set until you are able to get the images safely into your formal backup strategy (one that includes off-sight storage). It is simple to add portable computer hard drive storage capacity via external hard drives. For a DSLR to be "entry level", there must be concessions made. Performance, specifically frame rate and buffer depth, are two concessions made by the Rebel T7 and similar models before it. Here is a comparison chart showing performance metrics. 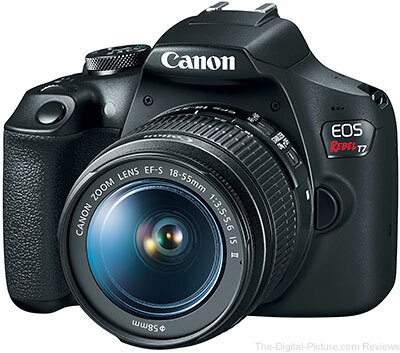 View the full Canon EOS Rebel T7 specifications to compare additional cameras. The increased image resolution has apparently caused a reduction in the JPG buffer capacity, though RAW format shooters will appreciate the 11 figure better than the T6's 6 shot spec. To test the 3 fps drive mode on the T6 RAW file buffer specs, I configured the camera to use ISO 100, a 1/4000 shutter speed (no waiting for the shutter operation), a wide open aperture (no time lost due to aperture blades closing) and manual focus (no focus lock delay). The lens cap remained on (insuring a black file and the smallest file size) and a freshly-formatted fast memory card was loaded. Using a Lexar 128GB Professional 1000x UHS-II SDXC U3 Memory Card, a card considered fast at review time, the EOS T6 repeatedly captured 8 frames in 2.41 seconds for a 2.9 fps rate, exceeding the buffer depth rating by two and falling irrelevantly shy of the 3 fps rating. Using this card, an additional frame was captured each second after the buffer filled. Note that the buffer filled at 5 frames after 1.38 seconds when ISO H: 12800 was selected. It is normal for reduced buffer performance at very high ISO settings. The T7 has the same drive system and will deliver the same frame rate as the T6, though the buffer depths will be different, in large part due to the increased resolution. Here are the MP3 audio clips of the Rebel T7 (T6) capturing images. Camera sounds are recorded using a Tascam DR-07mkII Portable Digital Audio Recorder with record levels set to 50% at -12db gain and positioned 1" behind the rear LCD. Again, the T6 results are substituted for the T7 sounds here. They are the same in this regard. This is a rather quiet camera. Those needing even quieter operation can use Live view (shooting using the rear LCD) to further minimalize the Rebel T7's audibility. Having a slow frame rate (and shallow RAW buffer) makes the Rebel T7 less well suited for capturing fast action and less well suited for capturing many shots of a time-critical event. A lot can happen in 1/3 of a second. For an example, I'll take you to the 100m dash finals at an invitational track meet. Time the first frame capture with a runner's lower leg hidden behind them and ... every frame in the burst may have a hidden lower leg. I usually delete such images immediately, but in this case ... I would have no images remaining. While on the subject of timing, the Rebel T7's 120ms shutter lag is not going to be so helpful when recording images of time-critical events. This lag is very short compared to many point and shoot models, but it is much longer than, for example, the EOS 80D's 60ms shutter lag. This camera's max shutter speed is 1/4000, an amount adequate for most scenarios, but less than the 1/8000 rate available on higher-end units. That the Canon EOS Rebel T7's performance specs are among the weakest in the Canon lineup does not make it a bad camera choice. It is simply not designed for high performance action and sports photography – with other factors (primarily low price) being its advantages. Another compromise made for a lower T7 price tag is the autofocus system. 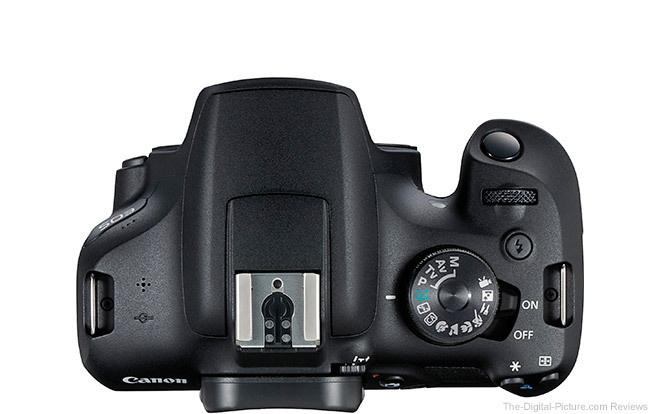 The Canon EOS Rebel Series DSLRs get Canon's entry-level AF systems. While not the highest performing, Canon's entry-level phase detection AF is still very fast compared to contrast-detection AF found in many point and shoot models and smartphone cameras. The Rebel T7's AF system has been inherited from the Rebel T3. This is a 9-point AF system featuring a high-precision, f/5.6 cross-type center point (sensitive to lines of contrast in two directions vs. one) surrounded by 8 AF points arranged in a diamond shape. All EOS Rebel DSLRs require a lens with a maximum aperture of at least f/5.6 or wider (as reported by the lens) for AF to function. This encompasses all autofocus lenses currently available, though some lens plus extender combinations will not be autofocus supported. This AF system's working range is EV 0 - 18 for the center AF point and EV 1-18 for the other AF points. In general use, the T6, and by inheritance, the T7 very reliably delivers accurate focusing in One Shot AF mode. AI Servo AF mode, instructing the camera to predict the point of focus at the time of shutter release while tracking a moving subject, is far more challenging to a camera. 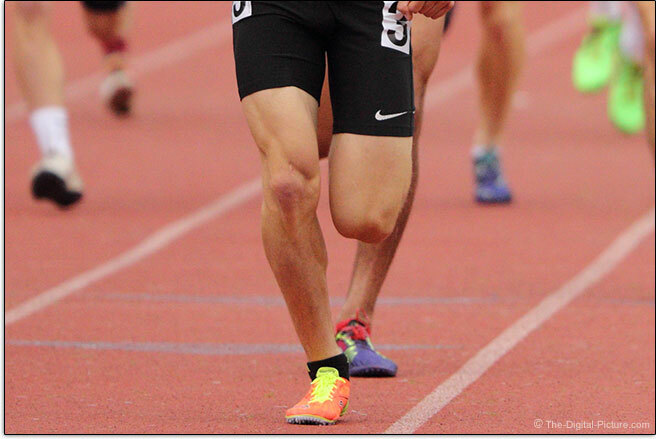 I photographed a track meet with moderate success using the T6. This is not the AF system that I would choose for challenging AI Servo fast-action capture, but the better systems of course cost more. While the T7 has contrast AF available in Live View mode, this focus method is painfully slow compared the fast DSLR phase detection AF speeds or the Dual Pixel AF implemented on many current EOS models. Rebel T7 video quality and features are impressive for its price tag. Movie exposures are either Program Auto Exposure or manual exposure. Because the Rebel T7's Movie function is found on the Mode Dial, a menu setting is used to specify Auto or Manual exposure for movie recording. ISO speeds up to ISO 6400 can be used in manual exposure mode. The Rebel T7 creates H.264-encoded .MOV files and sound is recorded through a monaural microphone (Linear PCM, manual or auto levels, no wind filter). An SD Class 6 (which is rather slow) or higher memory card is required for video recording. Video files can be up to 29 minutes, 59 seconds in length or up to 4 GB in size. When either limit is reached, recording will stop and can only be restarted with user intervention. A 3.5mm jack for an external stereo microphone is not provided. The quality from the built-in mic is not bad, but without an external mic port, an external recorder is needed for best results. An integrated mini-HDMI port makes it easy to view the results on any HDTV. All compatible lenses can be used for video recording including Canon EF, EF-S, TS-E and MP-E lenses. Autofocus options in video mode are the same as Live View shooting: FlexiZone - Single, Face-Tracking Live Mode and Quick Mode. AF in Video/Live View mode using FlexiZone - Single or Face Tracking is ... a bit slow. If you choose to use Quick Mode for focusing, the video will pause while the phase detect AF sensor is employed for focusing. Unfortunately, continuous AF in video (or Live View) mode is not supported. In the T6, Video Snapshots was a new feature for the Rebel T*/****D series of cameras. Originally appearing in the EOS 70D, video snapshots are short 2, 4 or 8 second videos that can be organized into an album and played back with optional music. While I do not personally use this feature extensively, I anticipate many consumers will find this capability useful for enhancing their social media presence. That said, if shooting videos is high on your priority list, you may want to step up to the EOS Rebel T7i, 77D, 80D or 7D Mark II to enjoy more extensive video options and AF capabilities. Otherwise, from a value perspective, the video capabilities alone found in the Rebel T7 are worth far more than the cost of the camera and lens kit. Like the Rebel T5 and T6, the Rebel T7 features Canon's 63 zone dual-layer light sensor, housed within the viewfinder. 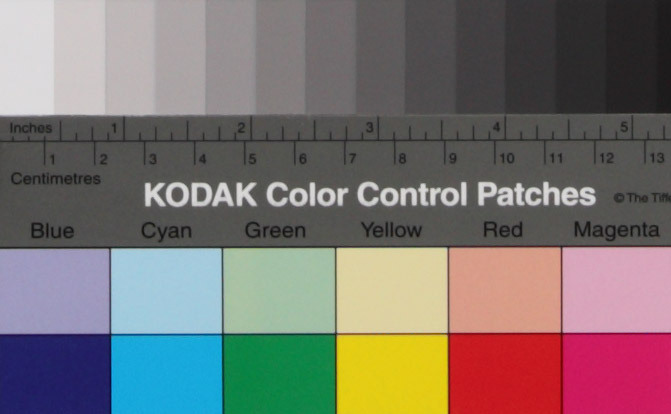 By accounting for color and luminosity in addition to the amount of light coming into the camera, the camera is able to calculate exposures more accurately. The T6's metering system worked quite well. Evaluative metering (linkable to all AF points), Partial metering (approx. 10% of viewfinder at center) and Center-weighted average metering are available with spot metering being notably absent. The metering range is EV 1 – 20, adequate for average use, but lacking in very low light levels. The T6's auto white balance performed well and EOS cameras are highly regarded for delivering great color. DSLR viewfinders are very nice relative to point & shoot camera viewfinders (if they even have one), but the T7 viewfinder is small relative to DSLR cameras overall. Perceived viewfinder size is much about what you are used to, but the T7 has a small body size with a small viewfinder to match it. Just having a usable viewfinder is a huge asset compared to point and shoot models completely lacking such. Viewfinders are useful for stabilizing the camera against your eyebrow and they have an especially big advantage when shooting in bright sunlight, enabling the scene to be clearly seen and the composition framing clearly delineated. Putting a DSLR viewfinder to your eye blocks out all except what you will see in your image – and sometimes even a little more. The T7 viewfinder provides 95% coverage, so you are going to have a little more subject in your image than you see in the viewfinder. I seldom hear people complaining about this issue and you do get used to it. But, during post processing, you may need to crop out some things that unintentionally become present in the borders of your image. Being used to using 100% viewfinders, I often find the 95% viewfinders slightly annoying when reviewing my images. The T7 continues the EOS Rebel tradition of using a pentamirror vs. pentaprism for the viewfinder. A pentamirror viewfinder is lighter and less expensive, but with more air-to-glass surface transitions, a pentamirror is not as bright. In keeping with its entry-level positioning, the Canon EOS Rebel T7 features a minimal set of controls and basic functionality. Here is a short tour of this body, starting with the back. 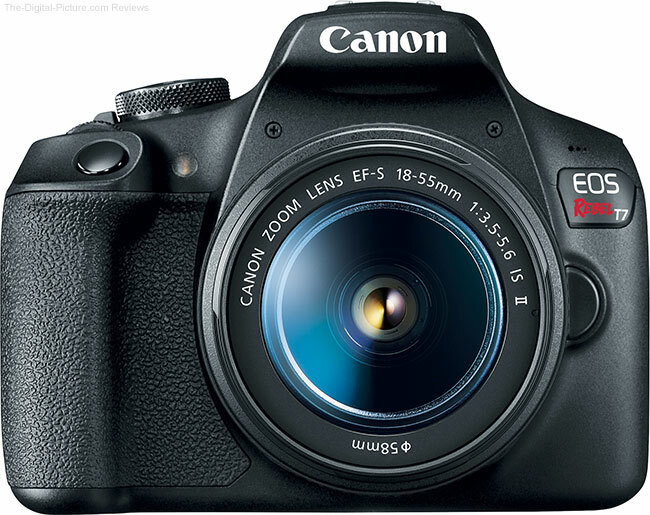 To compare the Rebel T7 with many more Canon EOS camera models, use the site's camera body comparison tools. Can you see the difference between the T7 and T6? There is one. The T7 gets the requisite mode dial texture tweak. The major T6 back of the camera change from the T5 was the addition of the Wi-Fi indicator light. The other changes were subtle and not worth a discussion (the mode dial texture was also changed). The back of this camera, like most other DSLR cameras, is dominated by the LCD. As was the case with its predecessors, the Rebel T7 designers realized cost savings in their choice of LCD models. The T7 gets a fixed (vs. Vari-Angle) 3.0" (7.5cm) TFT with approximately 920k dots and a 170° viewing angle. While this LCD works fine, the difference between it and Canon's better Clear View II LCDs is obvious in a side-by-side comparison. The better LCDs show far less reflection, providing richer, more vibrant colors with better contrast, especially under bright sunlight. Still, the approx. 920k dot resolution is an upgrade from the approx. 460k dot LCD on the T5, which was itself an upgrade from the 2.7" (6.8cm) TFT, approx. 230k dot LCD found on the T3 (the T5's predecessor – the T4 was skipped). The T7's LCD, lacking anti-smudge coating, is also harder to clean than the better models available. 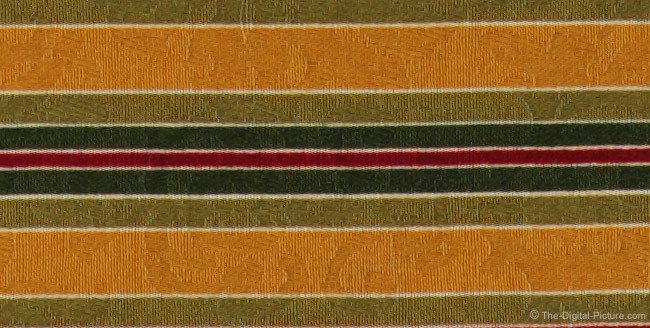 Perhaps next-dominant on the back (omitting the viewfinder) are the plentiful buttons with the group of 4 cross-keys encircling a set button being most prominent. Each of the cross keys has a direct-access function and also functions as a directional arrow for navigation such as in the menu or within a zoomed image being displayed. They are easy to use, conveniently located and comfortably contoured. As the menu system (accessible via the button below-left of the cross keys) makes use of both the cross keys and the LCD, this seems like a good time to mention the logical layout and ease of use that the Canon DSLR menu systems are strongly reputed for. 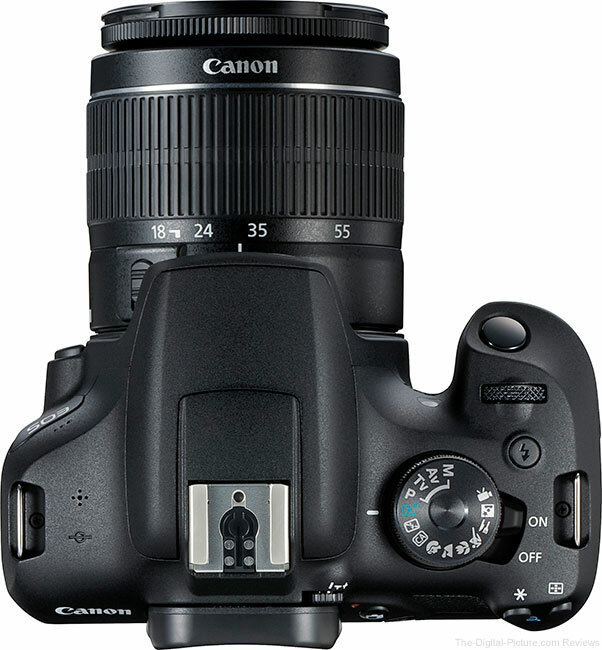 From the entry level menus right up to the complicated 1-Series body menus, Canon DSLRs are easy to navigate and configure. The T7 top is identical to the T6. Can you spot the two Rebel T6 changes from the T5? The first change was that the flash up button label moved to the button itself. The second change? Food mode was added to the Mode dial. You no longer need to waste effort thinking about the settings needed to make your dinner look great. Just turn the dial and shoot your dinner. Via Wi-Fi, you can have your dinner picture on your favorite social media site before your tasty meal begins to cool. The Rebel T7 provides modes designed for complete beginners through seasoned experts. Canon's fully-automatic, point and shoot Scene Intelligent Auto mode enables especially the former group to capture excellent images without a deep understanding of the camera controls. SIA mode utilizes the EOS Scene Detection system to determine the type of scene being photographed and adjusts the camera settings to best capture your image. According to Canon: "[Scene Intelligent Auto] uses the EOS Scene Analysis System, which joins Picture Style Auto, Auto Lighting Optimizer, Auto White Balance, Autofocus and Automatic Exposure. 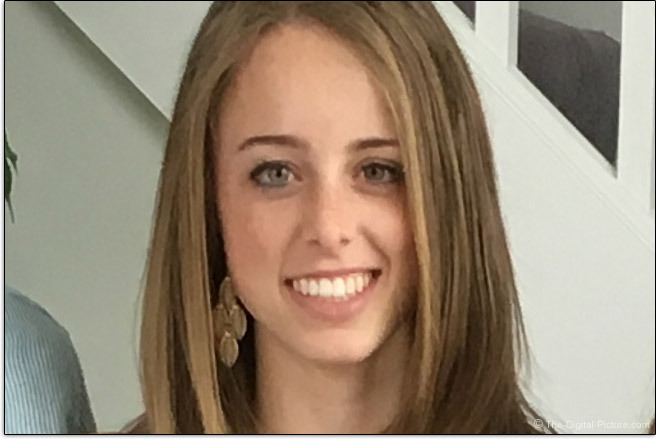 This automatic feature helps analyze the image, accounting for faces, colors, brightness, moving objects, contrast and whether the camera is handheld or on a tripod. Scene Intelligent Auto mode then chooses the exposure and enhancements that can bring out the beauty in virtually any scene or situation. Simplifying DSLR image capture, Scene Intelligent Auto mode lets you concentrate on composing images without puzzling over settings." Those wanting to provide more scene/subject information to the camera can select modes including portrait, sports and landscape modes. The camera will automatically choose the settings it expects to be best for capturing the selected subject type. The "CA" (Creative Auto) mode is included and allows the photographer to adjust the shot settings using easily understood words instead of using f/*. * aperture settings and 1/*** time value shutter speeds. These settings are displayed on the rear LCD while adjustments are being made. Advanced photographers can have as much control over the camera settings as they want, with the popular Av mode through fully manual mode available. The higher end EOS camera models provide additional top-of-the-camera controls ranging in count from few to many, with a dedicated ISO button being frequently included. The T7's flash up button can be reprogrammed (using the menu) to perform as the ISO button with the flash up function then being handled in the Quick menu. The 77D along with 80D-and-higher models add a top LCD with, again, more buttons for faster and easier control over the camera. The side of the Rebel T7 remains unchanged from the Rebel T6, T5 and T3. A rubber port cover hides an E3-type remote release port (not an N3-type), USB port (USB 2.0 mini-B) and HDMI mini output port (HDMI-CEC compatible). Canon's EOS Rebel cameras are all small, relatively speaking, with the T7 being not much larger than many point and shoot cameras. While the larger bodies are easier to control and especially so when a large lens is mounted, small size is great for convenience and portability – and for small hands. And speaking of small hands, purchasing a Rebel T7 is a great way to introduce your kids to photography. I’ve spent many quality hours photographing with my three daughters. With a T7 in-hand, they have all of the features needed to learn far more than the basics of photography. Photographing together is not only great fun and a great driver of time spent together, but it is also a great way to inspire creativity. Also small is the T6's neck strap, being narrower than Canon's standard DSLR neck straps. The 1.2" (30mm) wide neck strap has a rubberized non-slip back and is very adequate for the camera's size and weight. A benefit of the smaller strap is that it takes up less space in a case. I've carried the T6 camera while trail running, foregoing the strap entirely, simply holding it by the kit lens. It was not even heavy enough to be considered an exercise aid. 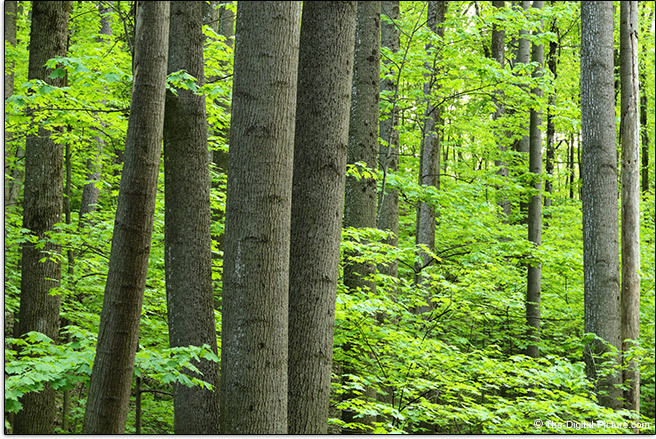 The woods on this spring day were beautiful, with the fresh leaves being very saturated in color. During my run, upon finding numerous large poplar tree trunks adding some order to the chaos of leaves, I sat down on the trail and formed a tripod with my legs (knees leaning into each other). With the camera held tight onto my knees, I turned on Live View, framed, focused and, with the aid of image stabilization, captured this sharp image with a long .4 second exposure. While the Rebel T6/T7 is entry level, it does not feel cheap in the hand. The Rebel series is not built as well as the *0D series cameras, but these cameras still have a solid, quality feel to them including a rubberized grip surface for fingertips. You will not hear marketing bragging about a magnesium alloy chassis or extreme weather sealing when describing this camera's features, but constructed of carbon fiber/glass fiber and polycarbonate resin, the T7 should hold up very well to normal use. Shutter life rating is a spec that marketing also omits and an entry level camera undoubtedly gets a basic shutter system. It is unusual that I hear of an EOS shutter failing under normal use and I doubt that many will experience this problem with the T7. Arguably the biggest change from the Rebel T5 was the Rebel T6's built-in Wi-Fi and NFC capability and the T7 gets the same. Wi-Fi and NFC provide easy transfer of images and movies to compatible mobile devices using the free Canon Camera Connect app. With lots of potential awaiting development, this app provides some remote control of the camera's settings and shutter release when shooting still images. Wireless remote printing to a compatible printer is also supported via Wi-Fi. Note that the Rebel T7 does not include a self-cleaning sensor feature. Also note that this camera does not have the mirror lockup feature, requiring Live View to be used for this functionality. The T7 has a built-in flash – like all of the Rebel models before it. Not so obvious is that the T6/T7 flash is rated to only 9.2 GN (vs. the T7i's 13.1 GN rating). While this flash can add some fill light and can serve as a main light in close settings, it is not going to strongly light a big scene in complete darkness. It is also important to note that, unlike the T7i, the T7 does not have an Integrated Speedlite Transmitter. You cannot control remote Canon flashes without an external flash controller (such as the Canon 600EX-RT Flash and Canon ST-E2 Speedlite Transmitter). Like the Rebel T7i, the T7's flash max X-Sync shutter speed is 1/200 sec. The Canon EOS Rebel T7 uses the same battery as the Rebel T6, T5 and T3 – the small and light Canon LP-E10 Li-ION battery pack. The included LC-E10 charger is conveniently small and plugs directly into the wall (no wires). Relatively small and the same as the T6 and T5 is the T7's battery life rating number. There are a lot of parameters that affect battery life (especially flash use), but the T7 is rated for approximately 500 shots. Canon's standard ratings can often be surpassed, but a second/spare battery takes up little space and adds little weight in the bag with 2x as many shots then possible. The T7 tracks 4 levels of battery charge on the rear LCD. The entry-level Rebel line is light on dedicated accessories. Canon does not offer a battery grip for the T7. Note that third party battery grip options are available. One semi-dedicated accessory that is compatible is the GPS Receiver GP-E2. 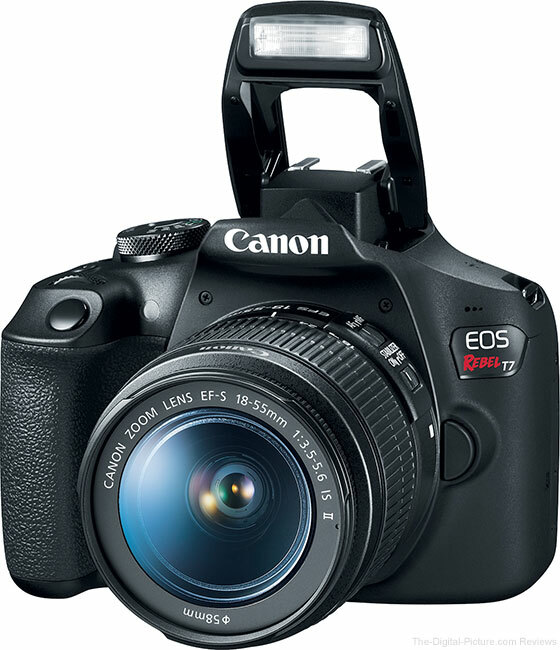 The Canon EOS Rebel T7 is compatible with a huge list of Canon (and third party) lenses, flashes and other accessories. The camera body (or multiple bodies as is more frequently the case today) is the base your system is built on and a lens is the next essential piece of kit. As of review time, everyone is going to buy the T7 with the Canon EF-S 18-55mm f/3.5-5.6 IS II Lens because ... the T7 is currently available only in a kit with that lens. This is the same lens included in the 3-models back Rebel T3. It is a decent value lens for those with a very low budget and while it is far from the best quality lens available, the light weight and small size of this lens matches nicely with the T7. I understand why Canon opted to not package the better Canon EF-S 18-55mm f/4-5.6 IS STM Lens with this camera (to keep the price down), but that is the low end kit lens I would have preferred arriving in my box. DSLR camera image quality is only as good as the weakest link in the imaging system and the weakest link in this case is the lens. Review the Canon general purpose lens recommendations page to find the most up-to-date list of the best lens options. Then add, minimally, a telephoto zoom lens (the Canon EF-S 55-250mm f/4-5.6 IS STM Lens is great match) and a wide angle zoom lens (the EF-S 10-18mm IS STM Lens is a great match) to your kit. Unlike the T7i, the T7 is not compatible with the small Canon wireless remotes such as the RC-6. The Rebel T7 price subject is an easy one to address. Once the previous model Rebel T6 inventory is fully depleted, the T7 will be the lowest-priced, current model Canon DSLR available. This camera has the ability to create great image quality with an adequate-for-many range of features, but the low price is what will seal the deal for this inevitably very popular model. Keeping a current model DSLR camera review concise yet complete is a difficult balance to find and this review is not a complete description of every Rebel T7 feature available. Canon's owner's manual (a link to the manual will be provided with this review) highlights all of the features found on this camera and explains their use. The manual will inform you of a huge array of features and many other topics. Read the manual, go use your camera, repeat. Owning a Canon product gives you access to Canon support and the support I have been provided by Canon's USA division is excellent (sorry, I have no experience with the other Canon divisions). When I call for support, I get an intelligent person who sincerely wants to help me with whatever my question or problem is (let's just say I challenge them sometimes). Canon repair service, though I seldom need it, is fast and reliable. Enthusiasts may quickly roll their eyes at a newly introduced base camera model, but ... can the T7 be used professionally? While the Rebel T7 is an entry level camera, the image quality it delivers is pro-grade and images it captures are easily good enough for many professional applications. This camera is not nearly as featured-filled (lesser build quality, fewer controls, fewer options, lesser AF system, low frame rate and small buffer depth) or high-performing as those more-typically chosen for professional use, but there is a reason to implement the T6 for professional purposes: the low price. The Rebel T7 is really inexpensive, making it a good choice for sacrificial use or use in circumstances with a high risk of camera damage. Sometimes getting the shot is worth the price of a camera, but the budget can be stretched if that camera is not costly to begin with. Yes, a Canon EOS-1D X Mark II is more likely to withstand abuse, but the 1D X II costs 10x more than the T7 and it is still not indestructible – and not hard to steal if unattended such as when capturing a long timelapse sequence. The low price of the Rebel T7 means that the budget for an extreme shoot does not have to be ... extreme. Set up a T7 for a photo booth for great wedding and party fun. Mount the T7 to a car, motorcycle, bicycle, boat, etc. without worry. To a substantial commercial budget, the T7 is disposable and multiple backup cameras can be kept in inventory. Think about what shots or videos you could capture with camera destruction likely and the value of those images, especially on social media. The Rebel T7 is also a very affordable backup camera to entry level pros. All professional photographers should have a backup camera when photographing an event or other situation that cannot easily be reconstructed. I don't recommend the Rebel T7 as a primary camera for pro use, but starting pros may not have the budget for a higher end backup camera and the T7 can fill this need until such funding becomes available. Another reason for a pro to have one or more Rebel T7 bodies is because they are so light. Fatigue can kill mental and physical sharpness along with creativity. When a camera or multiple cameras (including a backup) must be carried for very long periods of time (such as on an extended backpacking trip) or during physically exertion (such as running, biking, snow skiing), pro-grade cameras may be deemed too heavy. In these situations, the light weight of the T7 may be preferred over the high performance and feature-rich pro cameras. Especially the primary camera decision must be made carefully in this case, but it is not hard to justify the T7 for professional backup purposes. That said, the Canon EOS 77D, Rebel T7i, EOS Rebel SL2 or one of the EOS M-Series models would be a better lightweight choice for professional use. The 24 megapixel images are sufficient for most uses and when the subject is not challenging, the T7 may be all that is needed to get the shot. Still life and product images are examples of photographic situations that are often uncomplicated and simply require a basic camera to take the picture. In these situations, a manual exposure setting and manual focusing may be preferred, leaving little complication remaining for the camera to handle. At the T7 price, one or multiple cameras can be dedicated to specific tasks. The age-old adage of "You get what you pay for" holds a lot of truth for photography gear, but ... the Canon EOS Rebel T7 defies this logic to some extent. While the T7 feature set is best considered basic/entry-level and this is not the ideal camera for many uses (including sports and action), there have been many iterations of Canon entry level EOS Rebel cameras and those now being introduced show the maturity of this product line. They are easy to use and they work well. They can take pictures that you will be proud to share with family and friends, will be happy to hang on your walls and will be treasured in the archives for decades to come. 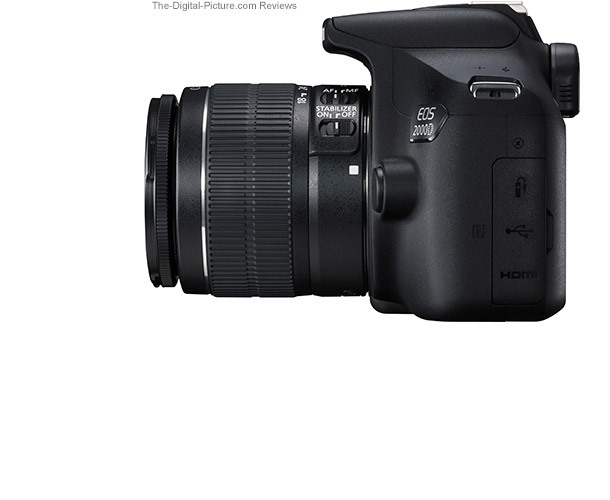 It is hard to complain about any of this camera's shortcomings when the price is factored in. The Canon EOS Rebel T7 is as a lightweight entry-level DSLR with a solid feature set and great image quality, but its best feature is its very attractive price.